Craig Revel Horwood – apart from being very famous from TV’s Strictly Come Dancing show – is a very experienced stage director and choreographer and I thoroughly enjoyed his 2013 Strictly Confidential show that I saw at Southend’s Cliffs Pavilion. However, he was also very responsible for the worst thing I have ever seen there that was the pantomime last Christmas, Snow White and the Seven Dwarfs, which was dominated by his giving a – for me – disappointing performance as the Wicked Queen. However, Revel Horwood now thoroughly redeems himself with his detailed and affectionate staging of Fiddler on the Roof that began in Southampton last September and now is approaching the end of a long tour. If you have the opportunity – and like me – are unfamiliar with this musical I urge you to see it while you still can. Fiddler on the Roof was created by Jerry Bock (music), Sheldon Harnick (lyrics), Joseph Stein (book) and Jerome Robbins (direction and choreography) and is based on the stories of Sholom Aleichem published between 1985 and 1915. It was a smash hit when it opened on Broadway in 1964 with Zero Mostel as the first Tevye and the initial production lasted for 3,242 performances, holding the record as the longest-running show on Broadway for many years. In 1967 it opened in London with Topol in the lead role and that kept going for 2,030 performances. There have been several revivals both on Broadway and in London with a number of national tours: a school or amateur theatre group will put it on somewhere every year and there was a successful 1971 film adaptation. I understand this country has subsequently seen some great assumptions of Tevye from Alfie Bass and Henry Goodman, although it was the film that Topol starred in – and which was partly made in the UK – that makes a real connection for the audience watching this current revival with what went before. Paul Michael Glaser (forever to be remembered as Starsky in the 1970’s US cop show, Starsky and Hutch) starred with Topol as Perchik, the revolutionary student, in Norman Jewison’s film. Of course the story has been now overtaken by modern history because the Anatevka shtetl (a small village in the country with a large Jewish population) that we see is now in the Ukraine but at the time was part of Tsarist Russia! ‘Tradition’ is the very memorable opening number and what follows is the unravelling of that tradition as our milkman hero, Tevye, sees three of his five daughters challenge this old order. We see two choose their own husbands rather than take the often quite unsuitable one arranged by their father and the village matchmaker. Another marries outside of the Jewish faith. Tevye, is a bit like the fiddler trying to keep his balance on the rooftop, because he struggles to maintain the balance between the love of a father for his children and his acceptance that the world is changing. Tevye right from the start is constantly caught up in the dialectics of what is best for the community – should it be stasis or change – and before our eyes is shown having to weight up the arguments of every dilemma – or as he puts it ‘On the one hand … on the other hand’ – when talking to God. The musical brings us a lot of warmth, humour and love but perhaps is a little light on the hunger, heartache, and tears the story demands. The ending – as the villagers are forced from their homes by a Russian anti-Jewish pogrom to further the diaspora by beginning new lives elsewhere – should be a lot sadder despite Tevye’s seeming optimism for what the future can bring. Their children have gone their separate ways and Tevye and Golde, his wife, are left alone, ready to set off for a new life in America full of hope. 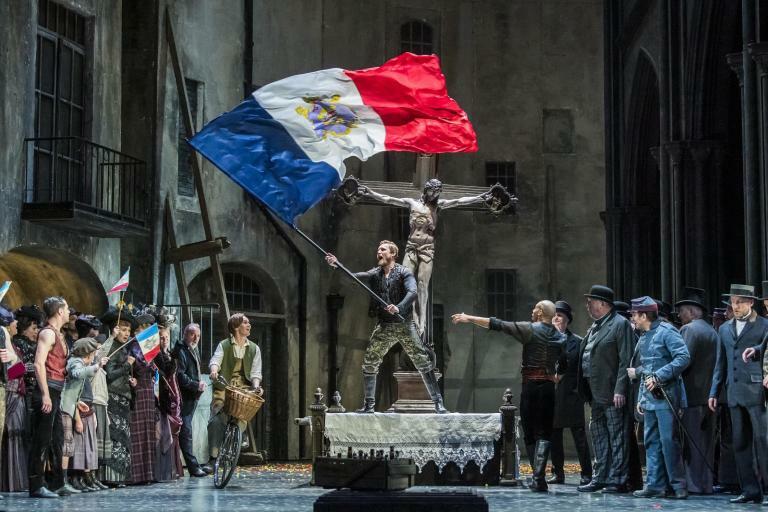 However, as the audience who first saw this musical in 1964 knew only too well, they will need to overcome more difficulties when they get there – and we all are only too aware of the plight of many of the Jews elsewhere during the twentieth century. Although it may be just a fault of Fiddler on the Roof as a musical – and not solely Craig Revel Horwood’s staging – that Eamonn O’Dwyer as the Constable, the head of the Russian authority, lacked gravitas and was rather too camp with his accent straight out of TV’s ‘Allo, ‘Allo! – not at all as threatening as he should be. Craig Revel Horwood brings the originality of some of his previous work to this revival as he uses actor/musicians for his hardworking cast of 20 and all have to be able to act, sing and dance as well as play all the music that has been imaginatively orchestrated by Sarah Travis. It takes a little while to get used to this approach because it is unusual to see someone involved in a dramatic scene whilst carrying around, for instance, a double bass, but eventually you get used to it. Revel Horwood’s staging aided by Diego Pitarch’s moveable atmospheric set (even if too brightly lit by Richard G Jones) generally keeps the story moving forward but it is all much too long. The show started at 8pm and did not end (with a relatively short interval) until 11pm – and for most of those in the audience of a certain age this would have been past their usual bedtime. A few scenes were particularly wonderful standout moments but hold up the show somewhat: in the inn scene Tevye leads a toast ‘To Life’ featuring an extravagant display of Jewish and Cossack folk dancing. T. Yhen there isTevye’s dream with its Michael Jackson Thriller-like mix of ghosts and ghoulies including Fruma-Sarah (Susannah Van Den Berg) actually hovering over the bed. Act I ends with the wedding and its exuberant celebrations, including the famous ‘Bottle Dance’, which is eventually brought to an end by some violence that was rather too retrained for the start of a pogrom. You might see worse on the Southend seafront any night at the weekend! Nevertheless, there are some, by turns, amusing, uplifting, touching, and thought-provoking moments in Act I including the familiar ‘If I Were a Rich Man’, ‘Sabbath Prayer’ and ‘Sunrise, Sunset’. As with most similarly unbalanced musicals nothing quite so wonderful happens after the interval when it all becomes more like a straight play. The musicians have significantly less to do and they are only a couple of songs that tug at the heartstrings; the bittersweet ‘Do You Love Me?’ for Tevye and Golde and the sadly poignant ‘Far From the Home I Love’ for him and his daughter, Hodel, who is off to Siberia to follow Perchik. Generally the cast act, sing and play their instruments very well and cannot be faulted: Jon Trenchard, brings to life Motel, the Tailor; Karen Mann is very good too as Golde, the mother of Emily O’Keeffe, Liz Singleton and Claire Petzal as Tevye’s daughters, Tzeitel, Hodel and Chava, who are each given clearly distinct personalities. Steven Bor revealed the genuine idealist in Perchik – but has no one else noticed the strange Afrikaans’ accent he uses? Praise must also be given to Jennifer Douglas who moved around the set with gamine balletic grace as The Fiddler, playing live for a change. If you do not have a charismatic Tevye there is no point in putting this show on because this character bears all its burdens and is virtually on stage throughout. It is a very demanding role and whoever takes it on lives in the shadows of Mostel who created the part and Topol who appeared in the film. There will always be comparisons – though not for me I have never seen the entire musical before as I wrote earlier. Paul Michael Glaser seems to have captured the true soul of the kindly Tevye. I genuinely believed he was a good man torn between his ‘tradition’ and that love of his family. He brought out in full the comedy and tenderness of the part, whilst his inner turmoil was equally apparent in some explosive moments of controlled – and occasionally not-so-controlled – anger. Paul Michael Glaser is an incomparable actor, if only a so-so singer, and he also appeared to be suffering somewhat from the strains of a long tour. But this sense of world-weariness only complemented a great performance and never detracted from it. I nearly always enjoy going to see something at the Cliffs Pavilion in Southend, possibly because it can eliminate the need for a long slog by train or car to London or elsewhere and is on my doorstep. It is apparently the largest purpose-built performing arts venue in Essex and is to be found on a promontory overlooking the sea. The Cliffs has a certain steely-grey stateliness and – especially when you are inside – the facilities make you think you are on a modern cruise ship. This is quite apt because most of its regular audience – which is mostly drawn from an older generation – would therefore thoroughly feel at home in this ambiance. Though its name suggests a Victorian seaside theatre, possibly at the end of a pier, that itself – and the entertainment it provides – had seen better days; you cannot be more far from the truth. With a full calendar of entertainment including its popular pantomime, symphony concerts, opera, ballet, comedy, West End musicals, plays and some of the world’s greatest headline acts … there is something on for everyone.